We do a deep dive on the Patriot League player of the year race as awards are about to be announced. If American's season ends early in the Patriot League tournament — a quarterfinal loss at Bucknell seems most likely — the 2016-17 season will be chalked up as a disappointment. A team that couldn't even win double figure games. Injuries. Regression for Delante Jones. An unsteady rotation. Except that it hasn't been a complete wash. It's been far from that. Freshman Sa'eed Nelson is a big reason why. Nelson has made a struggling, slow-tempo team fun to watch because you never know what he'll do next. From the opening minutes of American's opener at Maryland Nov. 11 when he and fellow freshman Mark Gasperini — who joined Nelson on the all-Patriot League Rookie team — scored American's first two field goals and he swiped the ball from potential All-American Melo Trimble to feeding Charlie Jones for the game-winning 3 at Loyola to close out the regular season, Nelson has been an exciting blur on the court. A twisting layup here. An up-and-under there. A hang-in-the-air then find an open teammate for a 3 here. A pickpocket and race to the other end and finish over a bigger guy there. "Oooohs" and "Ahhhhhs" were common in the stands at Bender all season, even late in games that American had basically lost. Getting to watch Nelson play was worth the price of admission. I think we all took a certain level of joy in watching Nelson, because we knew that here was a player — an absolute winner in high school — who could be playing in a higher-level conference but chose American. We felt blessed to have him. We groaned at his flaws — free-throw and 3-point shooting Sa'eed's biggest ones — but knew mishaps would be followed by dazzling displays. Throughout the season, opposing coaches, announcers for every Patriot League team, and everyone in between recognized Nelson's talent and potential. The numbers back him up. Nelson averaged 15.1ppg, fifth in the league; 2.8 apg (second among Patriot League freshmen); and 2.4 spg, first in the league and eighth nationally. Nelson was abysmal from 3-point range (22%) and had free-throw issues all year (55%), but to shoot 51% on twos (142-274) as a 6-1 guard is very impressive. Holy Cross' Patrick Benzan (55.6%) and Bucknell's Kimbal Mackenzie (54.2%) were the only league players as short as Nelson to finish that well inside the arc, and Mackenize made 84 fields and Benzan 64 — far fewer than the amount of times Nelson finished in the paint. According to Hoop-Math.com, Nelson attempted 58.2% of his shots at the rim and converted 59.5% of them — this for a team that was dreadful from 3-point range most of the year, causing defenses to sag and focus on stopping penetration. Benzan (65.7% and 59.1%) is the only short guard in the league who compares. Nelson was near impossible to keep out of the lane, and if he had shot a decent free-throw percentage he might've come close to leading the league in points per game. But hey, that's what summer is meant for, right? It's one thing for a player to be dynamic offensively. It's a whole other level for them to be equally engaged and exciting to watch on the other end. That's exactly what Nelson provided on defense from the moment he stole Trimble's candy through American's finale at Loyola. To be clear, American was a poor defensive team this year. The Eagles had a difficult time keeping opponents out of the paint, and had no defensive post presence. A rare blocked shot — usually by all-Patriot League defensive player Charlie Jones — was like an unexpected Christmas present. Usually, teams that got the ball into the paint would score or draw fouls (opponents had a 42% FTA/FGA, 308th nationally). But when the ball was on the perimeter, Nelson hounded opponents. He rarely got beat, and he made up for the times that he did by creating so many layups on the other end off steals. Think back a year or even two to three years to the Pee Wee Gardner era (much love, Pee Wee!). Remember how we often complained on the podcast that American had no fast-break game, that a layup in transition was more rare than a filled student section at Bender Arena? That was far from the case with Nelson. American turned turnovers into offense. Nelson's steal rate was 3.62% (6th best in the Patriot League) and the one thing American did well on that end was force turnovers to the tune of 20% of opponents' possessions (83rd nationally). Throughout the season, we wondered, When will Nelson slow down? He was consistently in the top 5 in minutes per game nationally. He played 40 minutes in 13 games and 45 minutes in a overtime victory over Colgate. Yet he continued to bang, continued to hit the floor hard on drives to the hoop, and bounce back up every time. Someone (I forget who) made the point that he played football in high school — he can take the hits. Not once did Nelson sustain a noticeable injury. If he did, his acting ability to not show it was Oscar-worthy. The free throws were an issue (anyone have a first half vs. second half breakdown? ), but other than that, Nelson was as effective in second halves of games as the first 20 minutes. Maybe equally impressive to minutes played is that Nelson was able to aggressively defend while staying out of foul trouble. He only fouled out of one game and got to four fouls in five others. That's really good for someone playing his minutes and so heavily involved in the game. The future is bright for American basketball with Sa'eed Nelson running the show. He established a great chemistry with Gasperini early on, and they'll only grow with a summer to work on their games in the framework of the Princeton offense, not to mention the team trip to Australia in August. It's been a forgettable season for American in many ways. But not when it's come to watching Sa'eed Nelson. And if American makes any noise in the tournament, you can bet Nelson will be in the thick of it. 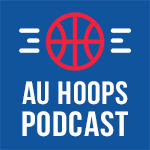 This is the official website for the ONLY podcast and blog dedicated to American University and Patriot League men’s basketball. Tune in to the podcast to listen from Jake “The Scribe” Lloyd, Dave “Well Dressed” Crespo, and Sam “Shotstop” Healy as they talk AU hoops like nobody else does!